What's this? A non PowerShell-related blog post??? Unheard of! Today's post is more of a novelty but perhaps someone might benefit from it. On 64-bit processors in Windows, the GS segment register stores the pointer to the PEB (Process Environment Block) in GS:[0x60]. In Wow64 mode this is a DWORD value. In 32-bit mode, the GS segment register is not used and uses FS:[0x30] to point to the PEB. For those of you who follow me on Twitter, you may have noticed that I posted a few teasers related to replacing processes in Powershell. Without further ado, I am releasing Replace-x64-Process. This tool is intended solely as a proof-of-concept tool. I say that because I make absolutely no guarantees that it will work in all cases. In fact, it won't work in many cases. The intent of this tool is to circumvent application whitelisting products. 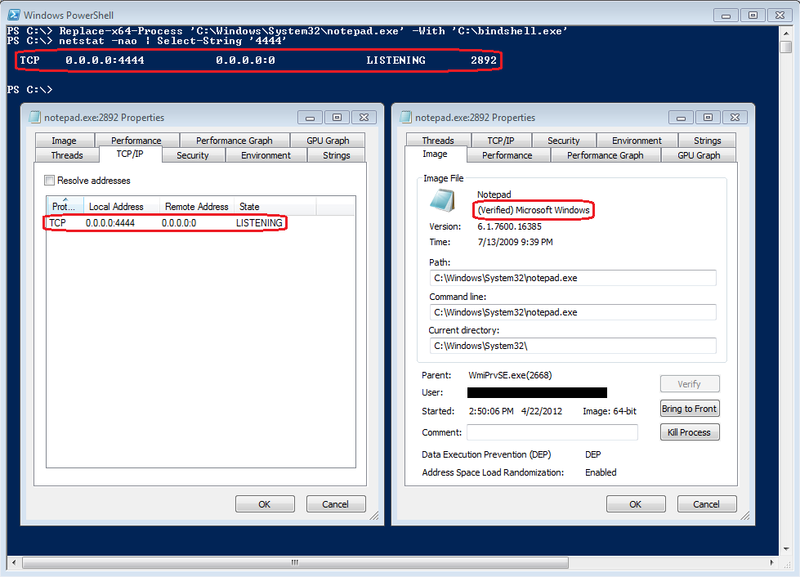 Assuming Powershell is whitelisted, you can use this tool to load a blacklisted executable within a whitelisted process. I have not tested this tool on any whitelisting products, however so I cannot attest to its level of effectiveness. Replace-x64-Process makes use of some common techniques seen in malware to replace a suspended process' executable image. Fortunately, Powershell gives us access to many of the mechanisms required to achieve this goal. 1) Load the host process in a suspended state. 3) Get the context of the suspended thread. In 64-bit the entry point to the process is located in RCX. A pointer to the PEB (Process Environment Block) is located in RDX. 8) Map the PE header and each section of the executable to the newly allocated memory. In the last example, it is worth noting that the Microsoft code signature is not invalidated after loading the malicious process. This is due to the fact that code signatures are validated prior to the main thread loading. This is an unintended but awesome side effect of this process. Lastly, I have a 32-bit version of this script. It is however even more flaky than the 64-bit version. I suspect it's due to the fact that I don't account for relocations. Because instructions in 64-bit are RIP-relative, relocations are no longer necessary. I may release a more polished script for both 32 and 64-bit in the future once I become more familiar with the loading process. Replaces an arbitrary process with another process. 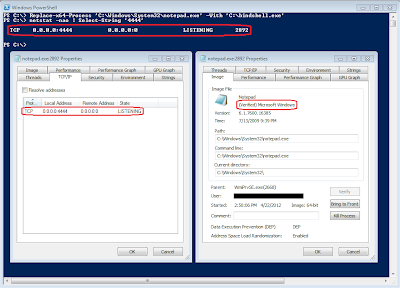 - It is assumed that executing Powershell is allowed. csc.exe through the usage of the .NET Reflection class. the loading process. I.E. Don't whine if it doesn't work unless you come bearing a potential solution. Specifies the host process to load suspended and replace. Specifies the target process that will replace the host process. Loads Internet Explorer and replaces its executable image with that of cmd.exe. Loads notepad.exe and replaces its image with cmd.exe and executes ping as an argument. Enjoy and try not to get too frustrated when the tool doesn't work for you. Also, if you use the -verbose option, you'll find that much of the code in this script demonstrates the beginnings of a full-fledged PE parser. Perhaps more on that in a future posting... If you have any suggestions on how to increase the reliability of this tool, please leave a comment.